This cosy rural villa for six provides authentic experience of the Mediterranean village as it once was. Restored using authentic materials, it has a traditional feel of belonging to a place. During 2009 restoration we tried to keep villa's authentic shape with careful attention to details. The villa offers all comfort one might look for in a contemporary home in harmony with tradition and nature. The villa has kitchen, dining area and living room; 3 bedrooms, 2 bathrooms. One bedroom (stone bedroom) with double bed and a bathroom is on the ground floor. Kitchen, dining area and living room, bathroom and one bedroom (pink bedroom) with two single beds and a private balcony are on the first floor. The third bedroom (romantic bedroom) is on the attic. There are outside stairs from ground floor (stone bedroom) to the 1st floor, and inner stairs only from the 1st floor to the attic (romantic bedroom). The villa has yard surrounded by the stone walls and a porch with a beautiful large table. 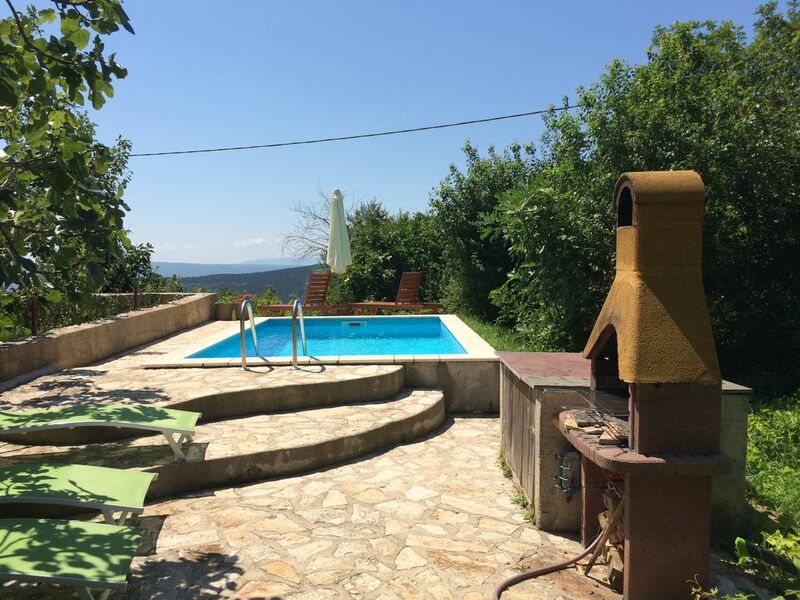 In front of the villa there is a barbecue and a pool (5x3) with a beautiful view on the surrounding mountains and sea. We are a young married couple. I'm the university teacher and Marko, my husband is an engineer. We are in tourist business for five years. We have one more holiday house ( you can check it out - the unit number is 1069533). We provide our tourists warm welcome, information and everything they need to have the best possible holiday. You are welcome to contact us with all your requirements ... Welcome:-))!! We absolutely adore Vinodol valley. The nature is so beautiful and the villages are picturesque and quiet and, still, it takes you only ten minutes to the city and the sea. This is the house that Marko's father bought 30 years ago, but a few years ago he decided to give the house to us. We renovated the house 4 years ago and used so many unique details that you would absolutely love:-). I love this house because it has so many beautiful details and provides authentic experience of the Mediterranean village as it once was. The villa is situated in a village that is under the Government protection, which confirms the natural beauty and the authentic experience of the Mediterranean village as it once was. Stone room has traditional rural bathroom integrated in the room (shower and wash-basin are in the room - but there is a curtain to secure your privacy while you are taking a shower). In this room, toilet bowl is in separated area. You can take a shower in a barrel that was made by the last cooper in this area. There is also one more outdoor shower near the pool. Charming house and very nice owners! Our stay at Casa Colori has been very comfortable: the house description was very accurate, even if it's not mentioned the splendid view and the vigorous grape arbour that in september must be a continous temptation. Kitchen and living room are very well equipped. Air conditioning is perfect. The bedroom at +1 floor is very hot if you decide to not use the AC (bur you WILL use AC! ), the bedrooom at -1 floor is a little cold, instead, but I think it's not a problem for the major of northern tourists. Anyway, this bedroom is really special... you've to see it! The whole house was perfectly clean and well maintained. The same for the pool (we used it a lot... fantastic), and the barbecue. We had a little problem with the wi-fi connection, but Marco and Borana were fast and effective to fix it. And they are a very very nice couple (and Marco speaks italian very well!). Hope to come back soon!! Excellent séjour a Casa Colori, qui porte bien son nom, belle maison très colorée. La maison est très agréable, très propre et très bien décorée avec beaucoup de gout et de petits détails. Nous avons passé un excellent séjour et avons apprécié la piscine. Thank you:-)))). We are very glad you had a nice time! It was a pleasure to meet you and your lovely family. a beautiful place to recharge the batteries! Nice and very clean house. The owners have helped us in each problem and they given us many tips that it is worth a try. I would recommend this lokation my friends. vielen Dank - es hat uns gefallen! wir haben die ruhige Lage sehr genossen. Die pool-Area war bei unseren Jungs (14+12+10) ein Hit. Wer eine Auszeit von City-Stress sich gönnen will - ist hier richtig. Die Stadt ist in ca. 10-15 Autominuten zu erreichen - somit hat man hier das Beste von den beiden Seiten "Land/Stadt". gerne wieder sagt Familie M.
Photos conformes à la réalité. Très bon accueil de la part de Marko qui est venu nous chercher dans le village. Fruits et vin en guise de bienvenue. La maison est extrêmement propre. Rien ne manque tant sur le plan de l'équipement de la cuisine que sur le linge de maison. Wifi fonctionne très bien. Jolie terrasse avec de la verdure. Nous avons adoré la décoration très colorée de la maison !! L'endroit est très calme aux pieds des montagnes. Juste un petit bémol : la chambre en pierres est dans une cave et l'odeur de l'humidité est très présente mais il y à une autre chambre en mezzanine qui est très agréable. The villa is situated near Grižane in Vinodol valley. Vinodol valley is famous for its natural beauty. You can enjoy a breathtaking view on the hills behind the villa and still - it takes you only ten minutes to the sea. In the hills (about 20 minutes by car) there is a famous rural restaurant with natural and traditional food and the road that takes you to the restaurant has a breathtaking view on the Kvarner bay (including the islands). In our villa you can enjoy your holiday in full privacy and beautiful nature. You can taste traditional domestic cheese, honey, jam, brandy, olive oil, wine, etc. in the surrounding villages. There are wine roads and summer feast in Pavlomir, vineyard situated 5 minutes from the villa. In Crikvenica and Novi Vinodolski you can enjoy Mediterranean food in fine restaurants or buy fish, meat, vegetables, fruit etc. at local market-place. Kvarner is just a few hours driving distance from Vienna, Munich... Distance from Crikvenica - 5km, from the County seat, the town of Rijeka - 25km, and only 160km from Zagreb - Croatian Metropola. The Rijeka-Krk Airport is just 20 km away and The Zagreb Airport Pleso is 160 km away.